(COVINGTON, La.) Sophomores in Kevin Moore’s World History Honors class recently completed their research papers on the history of one of six European countries: Prussia, England, Spain, Russia, France or Germany. “I assign this project every year because it encourages teamwork and helps students develop presentation skills, and also, of course, to learn the history of these different European countries,” Moore said. Students were required to write a 20+-page booklet detailing the history, famous people and notable events of their selected country. Most booklets this year ranged from 40 pages to 93 pages, particularly long books compared to previous years. Students cover every aspect of the selected country: wars, plagues, leaders, technological accomplishments and much more are all subject to research. The booklets were graded on the grounds of content and creativity, with a third grade based upon the presentation of the project. While World History teacher Andrew Dart read the papers and judged their content, Art teacher Gerald Ancar graded them on overall creativity. “I take back my first statement. This project has been one of the hardest things I’ve done in my life. I waited until the last minute,” said Fox, as he scrambled to print his paper at Office Depot along with 12 other students in the same situation. 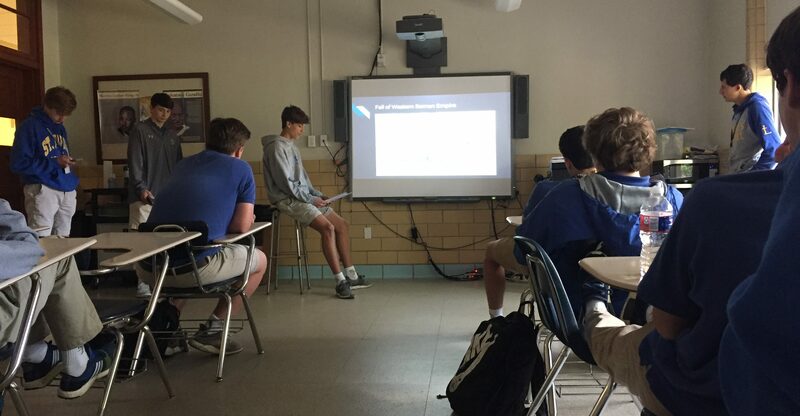 Finally, students were required to make a PowerPoint slide show that presented the entire history of their chosen country to the class, while Coach Moore grades the presentation in class. Overall, the project was worth a heavy 200 points, granting it the ability to make or break a students fourth quarter grade.